Which U.S. President gave money to the Taliban militants during the Afghanistan/Soviet conflict in the 1980's? It is unknown by me at this time if it was either President Jimmy Carter or President Ronald Reagan, but it was one of the two. The Soviets invaded Afghanistan on President Carters watch, so most likely it may have been President Carter. How much was given to the Afghanistan's, namely to now the Afghan warlord and former prime minister Gulbuddin Hekmatyar? How about $600 million in U.S.funds to help them fight the Soviets. Isn't that an eye opener?! 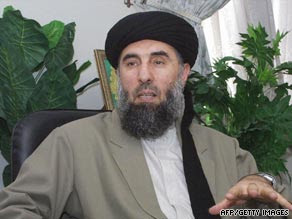 Now, Mr. Gulbuddin Hekmatyar is in the news as a leader with the pro-Taliban Hizb-e-Islami militant group. He now claims that he wants to help us, mainly claiming that the group he represents would stop attacks against coalition forces, and stop recruiting members while stopping the intimidation of local citizens. Wow, he is so gracious. He disgusts me. He is regarded as one of the top maverick militant players in Afghanistan. I guess he must now be feeling the heat as more than 13,000 members of NATO's International Security Assistance Forces are now fighting in Helmand. Over half are American troups. A total of about 21,000 U.S. troops now are fighing in Afghanistan, shifting the focus from Iraq. Most of the others are from the United Kingdom. In actuality, it looks as if he wants us to help him again by leaving Afghanistan. This notion may spark the interest of conservative leaders here at home, but I highly doubt if President Barack Obama would fall for such a trap. What guarantees can President Obama get from a group of militants that cannot be trusted? Maybe the militant leader wants to strike up a deal because he knows that he cannot win against a far superior force, the United States. Don't forget leave a comment back, Ok...!?? Its Good james, i think it was a step ahead. According to my opinion (sorry if my opinion is false) Taliban or we have to called the terrorist is like a disease, like cancer. It can not vanish, but it can relocated and so it can not move every where. I have experience of my brother cancer disease, as told by doctors in china, as long as the patient take the medicine regularly, the disease is not danger in they life. By doing such as like maybe carter has did give the money to them maybe they will obey and not harm the foreigner or coalition force there, and we can used them to do what we want as taking and give. In my opinion the terrorist were born because of their feeling of unfair and unjustified by the western. I hope my opinion is true, forgive me if my opinion is false..., thank you james.